Download trend micro internet security 2009 software free (30 days trial). 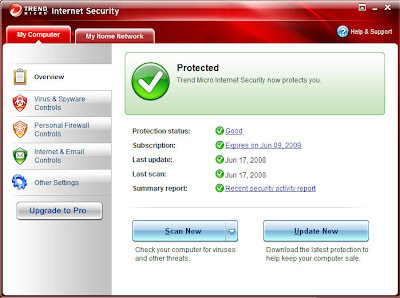 Trend micro internet security 2009is a basic internet security suite which protects your Personal computer from viruses, spy ware and other unauthorized programs and access. It also blocks malicious downloads from the internet and restrict access to malicious or harmful websites. Additional features in this software are Network Monitoring and Parental controls. Parental control feature helps you to prevent your children from accessing unwanted or harmful sites. It supports for Windows Vista and XP. At least 256MB RAM for XP or 512MB RAM for Windows Vista and 350MB of hard disk space is required for this software. Trend Micro Internet Security 2009 software provides browsing support for Microsoft Internet Explorer 6.0 with SP2, Internet Explorer 7.0, Mozilla Firefox 2.0 and It supports instant messaging softwares MSN Messenger 7.5 and AIM 8. Download Trend Micro Internet Security 2009 Free (30 days trail).